The mills in Bollington were developed by imaginative entrepreneurs. They were risky enterprises and several failed. Those that became profitable enabled the mill owners and operators to build their grand houses around the town – Rock Bank House, Bank House, Limefield House, Waterhouse, Oak Bank, Hollin Hall, the Mount, Turner Heath House, Rookery, Endon House, Endon Hall, and Ingersley Hall (pictured left and actually built by a local land owner), developing their estates in some cases with landscaped gardens and parks. 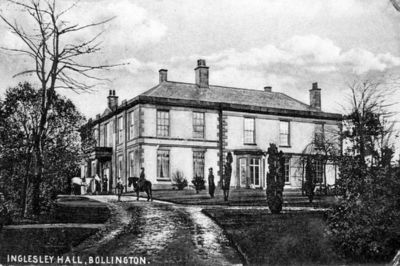 Many of the historical houses of Bollington are Statutarily Listed. * Properties marked with an asterisk are actually in Rainow parish but directly connected to Bollington.